VATICAN CITY (CNS) — Less than seven weeks before the start of his trip to the Holy Land, Pope Francis welcomed Jordan’s King Abdullah II and Prince Ghazi bin Muhammad bin Talal to his residence at the Vatican for tea and conversation April 7. The pope is scheduled to begin his visit to the Holy Land in Amman, the Jordanian capital, May 24. He will be welcomed in the royal palace, celebrate Mass in a stadium and meet with refugees and disabled young people at one of the sites along the Jordan River associated with Jesus’ baptism. “Naturally, the visit took place in the context of the upcoming visit of Pope Francis to the Holy Land,” said Jesuit Father Federico Lombardi, Vatican spokesman. 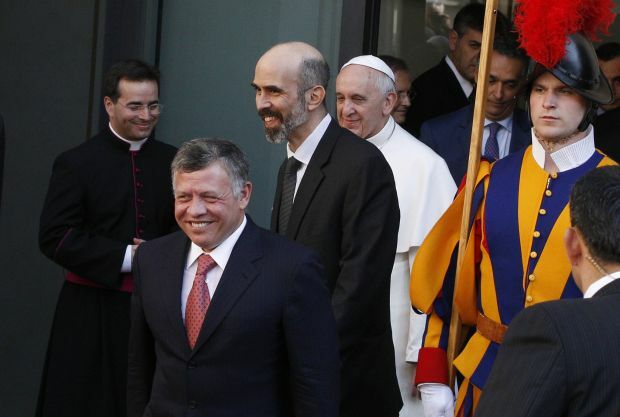 In addition to assuring the pope of how hard Jordanians are working to prepare his welcome, the king also spoke of their commitment to working together for peace and interreligious dialogue, he said. The king arrived in the late afternoon at the Domus Sanctae Marthae, the guesthouse where Pope Francis lives. The pope greeted him in the foyer, and then led him into a ground floor salon that was a conference room before Pope Francis decided to live at the residence rather than in the Apostolic Palace. King Abdullah introduced the prince to the pope and said, “Thank you so much for having us again.” The king had met the pope in August. The presence of Prince Ghazi, an adviser to the king on religious and cultural affairs as well as being active in the field of interreligious dialogue, indicated that dialogue was among the topics of the 45-minute private meeting April 7. Vatican officials said the customary gift exchange would take place through diplomatic channels. Father Lombardi said the conversations also continued over tea.